Do cross-functional teams lead to greater project success? It depends on who you ask. 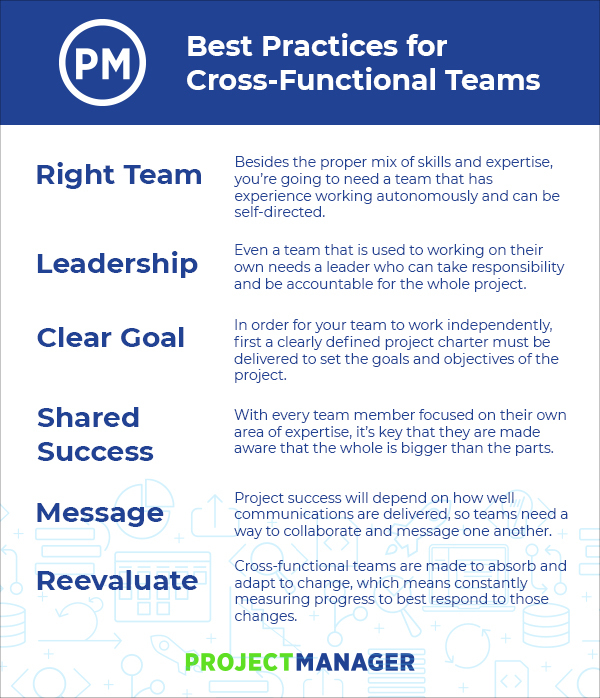 Some people believe cross-functional teams can be very productive, given they have clear governance, accountability, specific goals, suitable project management tools, as well as the organization to invest in and prioritize their success. Usually cross-functional teams are created to spark innovation, break bureaucratic boundaries and reduce production cycle times by granting a more collaborative environment. Others argue that cross-functional teams just aren’t worth it. According to a study cited in the Harvard Business Review, 75% of cross-functional teams are dysfunctional. The study found that they fail on at least three of five criteria, which are meeting the planned budget, staying on schedule, following specifications, meeting the expectations of their customers and remaining aligned with company strategy. But that failure rate doesn’t necessarily mean that cross-functional teams should be rejected. Rather than throw the baby out with the bath water, maybe cross-functional teams require a more systemic approach to set them up for success. Furthermore, sometimes if you’re a small company, building a cross-functional team is your only option, and if that’s the case, what’s the best way to setup these teams? But first, let’s define what constitutes a cross-functional team. A cross-functional team is a team in which the members have different skill sets, but are all working towards a common goal. It often includes people from different departments and from all levels of the organization, though it can also include participants from outside the organization. These teams are usually self-directed. They are assigned tasks, which are then uniquely approached because of the various expertise of the team members. Each participant can offer their own perspective, leading to a more “out of the box” solution. This creative approach can lead to innovation, which can be a substantial market advantage over the competition. Cross-functional teams often exist in small or startup environments. Because startups usually have a small number of employees, team members might have to perform a variety of tasks in different departments, thereby collaborating with those departments as well. This certainly creates a cross-functional team environment, even if the organization hasn’t acknowledged it yet. Experts vary on whether these teams work best cooperatively or in competition or even both. Because members of cross-functional teams come from many different departments (marketing, sales, finance, etc. ), they can subconsciously compete with each other by defending the interests of their core department. As far as the overall direction of a CFT, decisions can be made by consensus or by a team leader. Cross-functional agile teams are common. If a cross-functional team mixes specialists from different fields, agile teams take this a step further. They make them combine and require each team member to expand beyond their area of expertise. Also, agile demands self-organizing teams, which dovetails nicely into the way a cross-functional team works. Why develop cross-functional collaboration in your teams? Because team collaboration can help you work more productively and efficiently. Cross-functional collaboration can be a great team building measure and can build a more creative atmosphere. Here are six practical measures you can take to get the most out of your cross-functional team. There are a set of skills that are required to have an effective cross-functional team. The project will dictate some of these. The work is going to require a range of expertise from the team, and therefore that team must have people on it who have the various skills needed. But often overlooked is the shared skills each team member must have to create a well-oiled machine. It takes a certain type of person to work together in such a unique setting. These are independent self-starters who have the authority to make decisions. Ideally, they should also have experience working in such conditions. Some team members need to have their hands held and to be assigned task after task. These not the best candidates for a cross-functional team, which requires collaborative members who can work in a less-defined space. While it’s not a prerequisite to have one person lead a cross-functional team, the benefits outweigh the risks. First and foremost, everyone on the team needs to take responsibility. Find a leader who can give the team accountability and develop self-leaders out of each team member. A team leader needs to educate, delegate and give autonomy, while following up on their progress. Collaborate with the team, too, by inviting them into the planning process. If you can, get mentors to help shepherd the team and give them direction as needed. While cross-functional teams are collaborative, there needs to be a leader that is held accountable for the project success. Without that leader, there’s a greater risk of a rudderless ship that never makes it to the dock. Just like any team, if a cross-functional one isn’t given clear objectives they can find themselves going off into directions that lead to a dead end. Therefore, it’s crucial to have goals defined and in place before even assembling the team. Some of the ways to get those objectives defined are the same as any project. For example, you want to have a charter to define the project’s priorities. An approved budget gives everyone a financial roadmap. What are the outcomes you want and what time frame have you scheduled to have them completed? The sooner these markers are determined, the easier time you will have. Team members will be able to go off on their own, with greater autonomy, knowing what is expected of them, when it’s expected and what resources they need to achieve those expectations. When you have a cross-functional team, you have different team members with different goals. While all those goals should lead to the overall success of the project, that is not always the case. People can focus on their own small aspect of the project and neglect its part in the whole. Yes, the individuals on the team might not always align with other people on the team, which can lead to conflict, but that’s where the team leader comes in. They must lead the entire group to a shared success. It is, after all, the project and not the tasks that are the measure of success. Good communication is the hallmark of any successful project. You need to be able to articulate your needs and they must be heard and understood to move the project forward. The problem with cross-functional teams is that they are often not under the same roof, which makes communications more difficult. Communications need be open and frequent, so what can you do? The best plan of action is to find the right platform that speaks to your team. It can be a collaborative tool like Skype or Slack, or a more robust project management software that offers more functionality. More on that later. The beauty of cross-functional teams, and one reason they’re so often seen in agile environments, is that they are flexible and able to adapt swiftly to change. A cross-functional team is ideal when you want to speed innovations to market. To achieve that goal, means for reevaluating priorities and processes are needed. This includes performance reviews. Because to remain effective, teams must always be measuring their progress and success. And this happens not only as a post-mortem at the end of the project, but throughout its execution. Were objectives achieved? If not, why not? Adjust accordingly. As noted above, communication is key to success in cross-functional teams. They are working on different ends of the project at the same time, which involves a great deal of coordination. Communications makes sure no one is blocking another’s progress. But, as also noted, communications can be a challenge as team members might be scattered geographically. This can be a hindrance to collaboration. That’s where software tools come in handy. A project management software can offer a platform that facilitates communications and collaboration. With ProjectManager.com, you get real-time data, which means that wherever a team member is located, they’re getting an accurate picture of the project’s progress. Communications are also helped by our software, as it fosters conversations in groups or in one-on-one situations. Better than mere dialogues, team members can share documents, links and other related material to help them collaborate. These conversations can even occur at the task level of an online Gantt chart. If you follow the six tips and give your cross-functional team the right tools, you’ll find a winning combination that steers your project to success. ProjectManager.com is a cloud-based project management software that gives cross-functional teams real-time data and a collaborative platform. See how it can help your teams today by taking this free 30-day trial.